The boat trailer is definitely not the most exciting part about buying a new boat, but it is an entirely necessary one – how else are you going to go about transporting your boat from land to sea? Your mind might be on your beautiful new fibreglass, wood or metal beauty and the amazing fishing trips you’ll be taking out in it, but you also need to focus on the very thing that keeps your boat from crashing into the bitumen. We’ve designed a handy guide to help you with buying a boat trailer to suit all your boating and towing needs. Read on to find out more! What type of boat trailer should you buy? When buying a boat trailer, it really depends on the type of boat you have. 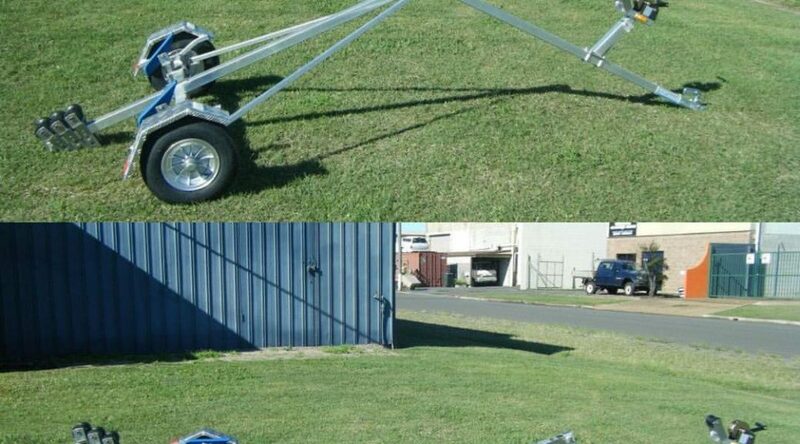 Boat trailers can be multi roller trailers, skid trailers and folding boat trailers. If your boat is made of fibreglass or has a plate alloy hull, then you should buy a multi-roller trailer. These trailers are the most receptive to having a boat driven onto them. They also often have rear cradles, which position the bow of the boat and align the hull. If your boat is up to 3.8 metres in length (usually tinnies and punts) and you are more of a caravanner or tourer, then folding boat trailers form Almac are your best bet. Our folding boat trailers are lightweight (less than 40 kg) and can be conveniently folded to be stored inside your vehicle or on the roof! What material should your boat trailer be made of? There are three types of materials used to construct boat trailers – aluminium, steel, and plastic. Obviously, each have pros and cons, which we’ve listed here for you. Steel is the most popular type of material used in boat trailers, and should ideally be galvanised. This will protect it if you intend to use your boat in salty or brackish water. Steel boat trailers are easy to paint, which make them arguably last longer, given that you’ve got that added layer of protection. They’re also highly durable, given that they’re exposed to all kinds of elements. A drawback is that you will still have to hose the trailer down after using it in water, so there’s no advantage there. Plastic is the least common material used to make boat trailers. It is highly resistant to corrosion from the elements but is more typically made for the wheel arches of trailers rather than the entire structure. Aluminium is durable, lightweight, and resistant to rust if the alloy isn’t of inferior quality. One of the major drawbacks with this type of trailer is that you need to be careful of poor-quality welding or cracks in the welding, which is caused by persistent flexing. One way to combat this is to choose a manufacturer like Almac Trailers. Our aluminium folding boat trailers are always of the highest quality and we only use the highest-grade marine aluminium for our folding boat trailers. Pricing will definitely factor into your decision making process, with steel being the most expensive. You’ll want to figure into your choice the trailer that is the safest and the most durable, while working out what will best suit your purposes as a boat owner. That is why we recommend an aluminium folding boat trailer from Almac Trailers, which is safe, durable and great value for money! When it comes to the size of boat trailers, each state in Australia has its own statutory requirements. You’ll need to check which apply to your state before you make any decisions or purchases. You’ll also need to choose the trailer that best matches the boat you have, as outlined below. Approximately 5.5 metres and with a Gross Trailer Mass under 2000 kg Mechanical brakes and a single axle. 6 – 8 metres and with a Gross Trailer Mass over 2000 kg Mechanical brakes and tandem axle. Brakes on every axle wheel. For more information about buying a boat trailer, contact us at Almac trailers on 4152 3737 today!